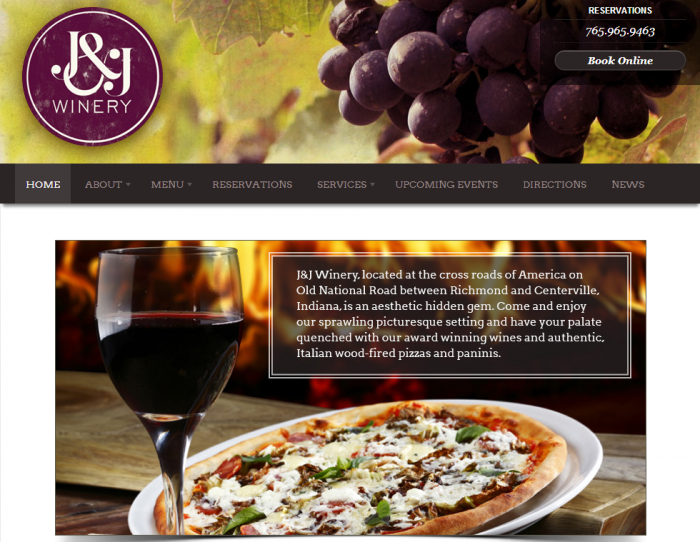 Tag Archives for " winery "
J&J Winery and Big Dawg Brewhaus have a brand new home on the web. J&J is a premiere Indiana winery and the only combination winery and craft brewery in Indiana. The reason the project has been so fun is we were allowed a lot of creative freedom and were encouraged to let loose on the site for a look and feel that fits what J&J is all about. We were able to add some cool features with their event calendar and reservations due to some very neat new plugins for WordPress which allowed us to incorporate them nicely into the design. For larger re-design projects like this, there are a lot of moving parts. And when you get to the marketing and visibility campaign, it gets to be even more fun. When a local business has a rich product line like J&J, the job of marketing is, overall, a lot easier because we have so much to talk about and promote. J&J has award-winning wines (see video), for instance, which makes social and search marketing easier. They do all kinds of events throughout the year including weddings, wine tastings, beer tastings, fundraisers, live music, you name it. Again, all that activity makes for a fun, active marketing campaign, especially through their social networks. Then, add an award-winning Indiana micro brewery with "buzz" coming in from all over the Midwest about the quality and care that goes into their brews. The events and announcements that are generated in a year just from the brewery alone make for additional points of engagement with the J&J Winery subscribers and social fan base. Last but not least is their wood-fired pizza. From my perspective, having "specialized" in trying any and all wood oven pizzas whenever I have a chance all over the country, J&J Winery pizzas are world-class. Together, the highlights of this business form a tsunami of good times, great tastes, and beautiful location. We invite you to check out the site!